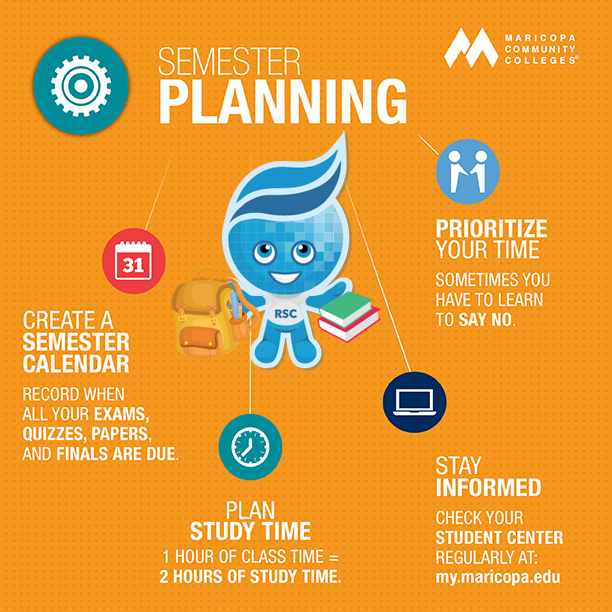 Rio Salado College | RioNews: Student Success Tip: Plan Ahead! Student Success Tip: Plan Ahead! What do successful students do? They plan ahead! Keep a record of when your exams, quizzes, papers, and finals are due. 1 hour of class time = 2 hours of study time. Don't overextend yourself, it's OK to say no sometimes. Ask questions and check for student news by way of your student center at my.maricopa.edu, your student email and our social media channels. Call on Rio Salado's Counseling & Career Services team. A counselor can assist you with personal and educational goals. When should you call? When you need help with issues such as a lack of motivation, relationship issues, study skills, test anxiety, time management, stress, goal setting, and access to community resources such as alcohol and drug abuse prevention resources.